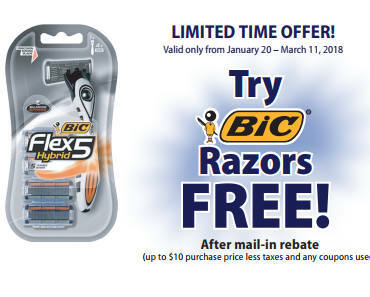 Get a FREE pack of BIC Disposable Razors (up to $10) after mail-in rebate. Simply claim online or mail in the fully completed rebate certificate along with your original receipt and UPC proof of purchase before 3/19/19. You’ll receive a check for the final price of the BIC Razor purchase price up to $10.00 (before coupons and tax).